Mysterious Marfa Lights – Ghost Lights – Paranormal – UFO – Swamp Gas? Mysterious Marfa Lights – Ghost Lights – Paranormal – UFO – Swamp Gas? Will anyone ever learn what causes the Marfa Lights? They have been observed just outside Marfa, Texas for well over a 100 years near the mountains. Some say the lights are caused by swamp gas, some claim vehicle headlights while others claim extra terrestrials or ghost of Native Americans wandering about at night with lanterns. The lights were seen before electricity and vehicles so it would stand to reason that the lights aren’t caused by those two suggestions. In fact the lights have been seen by so many people and so often that the State of Texas build a viewing platform with restroom facilities for viewers. For years there has been a spot on SH 67 where people pull over and wait for the lights to appear in the distance. It was a small area off the highway with a trash can. 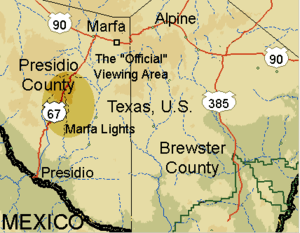 There is an interesting video on the Marfa Lights by Pecos45 that was done several years ago. It has interviews with residents from Marfa and shows the lights. The lights have had many skeptics and even the US government make attempts at either disproving them or learning what causes them to appear. The lights can be seen nearly every night. This author has seen the lights a couple dozen times over many years. Only to be disappointed twice by a no show of the lights. Years past the lights were easily seen and traffic was slow to non existent on the highway at night. This has changed quite a bit through the passing years. There were times when this author and a friend were the only people sitting off the side of the highway in the very dark night. That can become rather nerve wracking as minds wander while waiting to see lights. A few times there were unsavory characters that were more threatening than the lights. The new viewing station gives the area a feeling of safety and a place to sit and relax. There are lights on the building, but they are red to help one maintain their night vision. Now the highway is busy day and night with large trucks running the pipeline highway from Mexico into the U.S. with goods to deliver. It’s difficult to explain the feeling when observing the lights other than a great sense of wonderment. This comes from having no idea what creates the lights. Listening to other watchers inhale as lights are seen that appear to be headed straight toward them and then the exhale as they stop before coming too close. The light appear as one, many or as individual lights that split into more lights. The bounce, wiggle, move up and down. They go back and come forward and at times appear to pulsate and emanate different colors. This author spoke to a local resident who has come to view the lights throughout most of his life. He can’t figure them out. He told of an experiment he and several friends tried after receiving permission to go onto the private property that lies between the viewing station and the mountains. He said that a group of his friends stayed by the platform while another group headed onto the property in a vehicle. Both sets were armed with walkie talkies to communicate. While the group near the platform observed lights the other group tried to drive toward the lights, That group would lose sight of the lights almost immediately and were never able to get close to them. Each time they lost sight of the lights the group by the platform would has constant vision of the lights. He said when they were younger they camped on the desert floor and tried to walk toward the lights without success. A search on the Internet will bring up many links to information about the lights. Some lead to the UFO version while others lead to the end of the world. Native Americans lived all over this region of Texas hundreds of years ago and there are ghostly tales of warriors and chiefs wandering at night with torches looking for something. Have there been paranormal investigations done in this area? What would the investigators do? There is an article, Part 2 Where Paranormal Investigators and Ghost Hunters Tred that may shed light on how what is done. If anyone reading this article knows of any investigations into the Marfa Lights by a paranormal group, the author would like to know. Could they by ghost lights? These are described as a natural phenomenon producing a ghostly light sometimes seen at night or twilight over bogs, swamps, and marshes. The main problem with those who believe they are ghost lights is that this area is desert and not damp and humid. One thing the lights are most likely not would be Orbs! Hello, just աanted to mention, I loved tɦis post. It wɑs funny. Κeep on posting! These look like the same lights my late husband used to see as a young man 70 years ago here in south Louisiana. He said they would jump out in front of his car to race with them and would always stay ahead no matter how fast they drove. They seem to be alive and he said he thought they were a form of beings and always referred to them as “her” or “she”. He told me that even though they were very bright, they didn’t cast any light on anything or make shadows. They were plentiful until electricity came to the area with street lights, then they went away. They seem to need darkness. Folks used to gang up to see them in the Des Allemands area south of New Orleans. I was amazed to see this story about the lights. I guess when they left from here they went to Texas.